The PNS Ghazi was the naval submarine, which was used in the naval battle of India-Pakistan Naval War of 1971 during the Bangladesh liberation war and hence popularly known as Ghazi Attack. It was deployed in East-Pakistan ashore (which is now in Bangladesh east coast) to locate INS Vikrant and to destroy the Indian Eastern Command base of Visakhapatnam. The PNS Ghazi was the naval submarine, which was used in the naval battle of India-Pakistan Naval War of 1971 during the Bangladesh liberation war and hence popularly known as "Ghazi Attack". It was deployed in East-Pakistan shore (which is now in Bangladesh east coast) to locate INS Vikrant and to destroy the Indian Eastern Command base of Visakhapatnam. How PNS Ghazi came into Pakistan Navy Command? The Tench-class diesel-electric submarine i.e. USS Diablo (SS-479) was previously under the command of the USA which was leased to Pakistan in 1963 under the Security Assistance Program (SAP). Then after it was renamed into PNS Ghazi which was the first fast-attack submarine of the Pakistan Navy. It starts serving Pakistan Navy from 1964 and deployed at Karachi coast to stalk INS Vikrant (India's only aircraft carrier). But it was deployed at Eat Pakistan shores when it's unable to locate INS Vikrant because INS transferred to Visakhapatnam coast. That forced the Pakistan Navy to deploy PNS Ghazi to the Bay of Bengal. The episode of naval war theatre commenced when Pakistan Navy attacked INS Brahmaputra from Work War II-origin Mark 14 torpedoes, but not impacted as they assumed while stalking INS Vikrant. 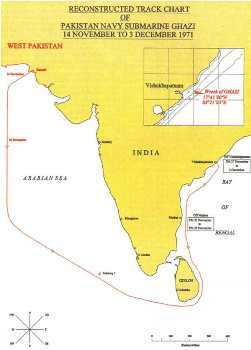 In 1971, INS Vikrant was transferred to Vishakhapatnam Coast that creates insecurity among Pakistani Naval Commander and in order to stalking INS Vikrant leads them to move Ghazi from the Arabian Sea to Bay of Bengal by sailing 3,000 miles (over 4,800km). What Caused the Pakistani Submarine Ghazi sinking? Indian Navy got wind of the Ghazi's presence off the Sri Lankan coast by local fisherman which was spotted by INS Akshay through oil slick. The divers of naval fleet confirmed the estimated length of submarine over 300 feet. That information stunned the Eastern Indian Naval Command because they knew that Pakistan had four submarines and only the largest one in the fleet was longer than 300 feet, i.e. Ghazi. Hence, the Navy ordered the submarines to slip out of harbour quietly. INS Rajput (guided-missile destroyer) was released the depth charges to blow up the PNS Ghazi under the command of Lt. Cdr. (SDG) Inder Singh. On December 4 1971, Ghazi was sunk during naval strike between INS Rajput and Ghazi but the Rajput suffered a serious material concussion to its structure. INS Rajput was sailed to mislead the Ghazi which was actually a suicide mission for Rajput because INS Rajput is nothing in front of Ghazi but giving as bait to Pakistan for the safety of Vikrant. Most interest and powerful weapon of Rajput was misleading the Ghazi through heavy wireless signals that makes them stronger. Thus, it was the accidental detonation of its own mines that destroyed the Ghazi and not INS Rajput‘s depth charges. The sinking of Pakistani submarine PNS Ghazi with 90 men aboard in the 1971 Indo-Pak war is regarded as one of the high points of India's first-ever emphatic military victory. Today, the submarine lies embedded in the seabed of Visakhapatnam about 1.5 nautical miles from the breakwaters which is close to the harbour channel. The spot has been marked on navigational maps to help ships avoid the wreck and tell the story of India’s naval glory. What is Surgical Strike or Covert Operation? What is the difference between Naga Sadhus and Aghori Baba? Why Pongal Festival is celebrated? Why was Industrial Revolution started in Britain? 813 Views Why was Industrial Revolution started in Britain? 796 Views What is the difference between Fascism and Nazism?